When you have poor nutrition, many of the muscles in your body begin to sag. They actually lose their proper posture. For example, if your heart muscle doesn't have sufficient B vitamins it can appear to be physically deformed because it begins to sag. The same thing happens with your eyes. If you have poor nutrition, the muscles that control your lenses cannot function properly and you end up with poor eye posture. I know this idea sounds radical, and most optometrists would not agree with this diagnosis, but this really is a more accurate description of what happens with your eye. Muscles don't just wear out; if you get good nutrition, your muscles' posture and function will improve. When you provide good nutrition for your body, you can reverse the poor posture of all the muscles throughout your body including your eye muscles, heart muscles and skeletal muscles. For example, there is a condition called mitral valve prolapse in the heart, which surgeons usually try to correct with surgical procedures -- but it can usually be reversed through good nutrition. The same thing is often true with the eyes. You can reverse vision problems through nutrition; one of the most important nutritional components for eye health is vitamin C, which is why the camu berry has turned out to be such a fantastic protector of eye health. I've heard of people who drank powdered camu, and within minutes leapt to their feet shouting, "I can see!" Within a few minutes, the vitamin C they consumed went into their bloodstream, passed through the blood brain barrier, and protected the retina and the nerves of the eye. Within minutes one woman was able to see with much greater clarity than she had for years, just from drinking this powdered camu berry. 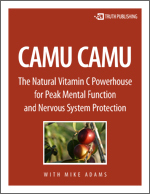 Camu camu is well known to be a protective food for cataracts. It doesn't mean that camu berry is an all-powerful, magical cure for every patient suffering from cataracts, but this is a superfruit that certainly should be investigated by anyone who is suffering from the condition. Camu also protects against glaucoma, a debilitating disease of the eye. The camu berry is 100 percent natural and based on powerful high-density nutrition. It has absolutely no negative side effects, and since it doesn't carry the dangers of prescription drugs. In other words, it won't cause heart attacks and strokes like many prescription drugs do, and it's less expensive than most prescription drugs.